I think we just found our favorite restaurant in downtown and it's not some hidden hipster joint, but Roy's Hawaiian Fusion restaurant now celebrating 5 years in downtown L.A.! They also have dining locations in Hawaii, Florida, Arizona, Chicago, Baltimore, Philly, Nevada and Texas. My mother having been to the one in Naples, Florida is a big fan of the restaurant too, but I had never been until last night. I was originally invited to a blogger event at Roy's a couple of months back, but was not able to attend, so they kindly offered to have me come do a tasting another time, which I gladly accepted. I was greeted with an 'Aloha" when I arrived and was seated by the window looking out at the downtown skyscrappers lit up at night. 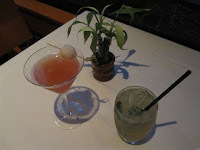 I was soon sipping their tropical cocktails from a Mango Mojito to their 1988 martini, which is a blend of tart grapefruit and tangy pomegranate with ABSOLUT Ruby Red Vodka, SOHO Lychee Liqueur and Patrón Citrónge Liqueur with a lychee fruit skwerer. For an appetizer we tried their Canoe for Two, which included two of their amazing Golden Lobster Potstickers in a butter sauce (I could of had a dozen of these easily and called it a night), Blackened Island Ahi, Pork Ribs, Shrimp, and a Spicy Tuna Roll. For dinner, I had the Roy’s Classic Roasted Macadamia Nut Crusted Mahi Mahi, which their sommelier paired the Newton "Red Label" Napa Valley Chardonnay with. I'm not easily impressed by wine pairings and often find the connection hard to taste, however, this was the best pairing I've ever had. The drink continued the meal, the meal continued the drink! I'd definitely reccomend this combo. Raphael meanwhile, had the Charred Japanese Misoyaki Butterfish, which was as scrumptious as the first time I tried that particular fish when I was in Maui. 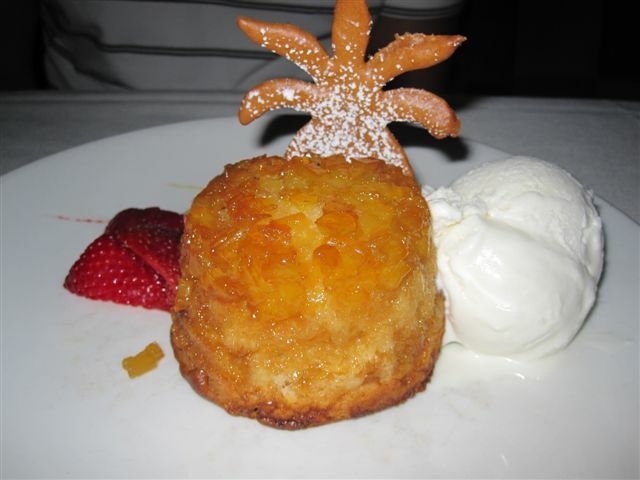 The restaurant also has two special dessert options that require 20 minutes to make them--a Chocolate Soufflé and a Pineapple Upside Down Cake. We ordered ours when we recieved our entres. Although I'm a chocolate fanatic, I was suprised to find that I liked the pineapple upside down cake more. If you haven't been, you should hurry in soon to take advantage of their LA Ohana Tour for a chance to win a free trip to Hawaii and score some free menu options (more info here). Also, now through Labor Day you can bring your own bottle of wine and pay no corkage fees. 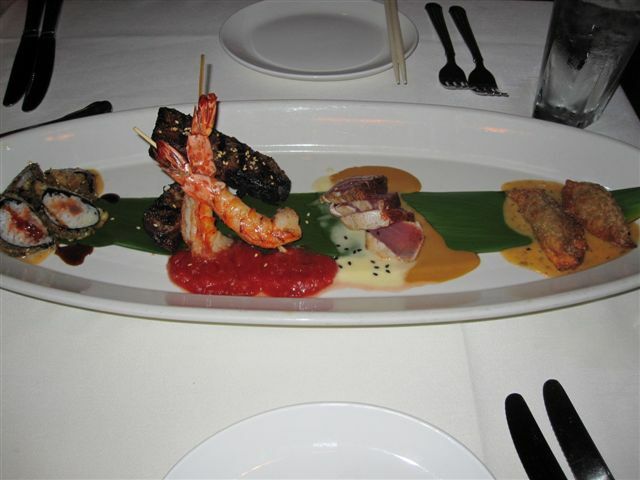 Ongoing though from 4:30 to 6:30 p.m. is their Aloha Hour where selected drinks and appetizers are $5. they also have a location in San Francisco! :) i love the food! They seriously have amazing food - reminds me of Mama's Fish House in Maui. 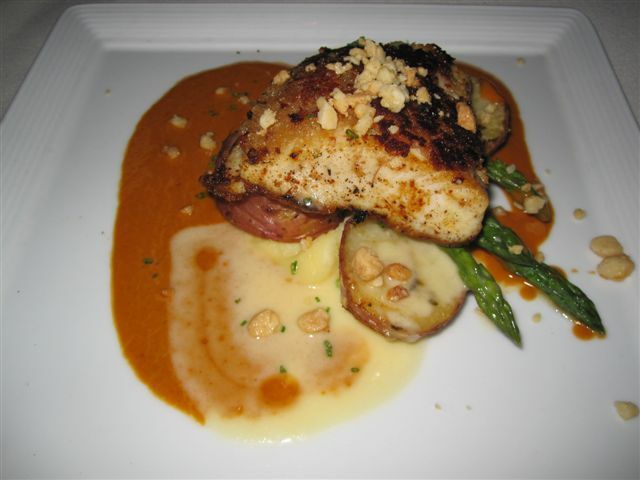 The butterfish seriously rocks. They prepare the best swordfish, I love it! Loving their tenderloin skewers and crisp calamari for happy hour. Glad I'm just across the street.